Sister Emily Stratton was wonderful, wasn’t she? We heard her report a few weeks ago to the High Council, and you could immediately tell that she was a wonderful missionary who was able to teach and preach principles of the Gospel that she knew to be true. She is a great example of what it means to be obedient. Principles she learned growing up in her wonderful family, or when she learned how to excel at golf and excel at canning peaches. Great job, Emily! My name is Nathan Bryce, and I was called to the High Council a couple of months ago. My wife is Kristin, and we have four sons, Chris, Andy, Matt and Tim. We’re now in our 20th year as Oremites. Before that we lived in Arizona. Which is where my great-great grandfather, Ebenezer, was sent by Brother Brigham. You may have heard of Grandpa Bryce—down in Garfield and Kane county there’s a canyon named after him. I’ve never been there, but I hear it’s a heck of a place to lose a cow. This morning, the stake presidency reminded the High Council to extend to you their love and greetings. I can testify that that love is real. They aren’t just saying it. It is a spiritual gift they received from Heavenly Father. And that love motivates them both day and night, week after week, and year after year, to do the best they can to bless our lives. I for one, am thrilled to be led by these inspired men. They are easy to love. The Apostle John once said, “For this is the love of God, that we keep his commandments: and his commandments are not grievous” (1 John 5:3). Many of us associate the word obedience with oppression and restriction. But I think that is one of the devils biggest lies. It is not grievous at all. In truth, I think that obedience is fun! That’s right, I said it: obedience is fun! I know, some of you may think I may not know what the word “fun” means, but I can assure you that with the right attitude, obedience can be fun. You see, the telestial world has created a long laundry list, a dirty laundry list, of things they say are fun, amusing, pleasurable, and gratifying to the human body and mind. And they are fun—but only for a few minutes. When the activity is over, the fun quickly fades away, leaving you with a desire for more and more. It can be quite addicting. It can be quite expensive. It never lasts for long, and there is always a price to pay—if it doesn’t require money, it will cost you other limited resources, like your time, undiscovered talents, or even your most treasured relationships. Not to mention your safety and security and peace-of-mind. Now, how fun is that? The telestial world has a truly warped idea of fun. The terrestrial world is a lot better—at least here people aren’t trying to con you out of your resources, or manipulate you, or just take whatever they want. There is a genuine sense of trying to live with honor, of being truthful, and living by a code of ethics. Fun comes from a sense of doing your duty, being decent to each other, and doing the socially-acceptable thing—at least most of the time. In a lot of ways, many of us are already living in a terrestrial kingdom. But what we’re really after is the fun that comes in a celestial world. Here, fun comes from helping others feel joy, rather than yourself. Everyone you meet is interested in helping you find joy, peace, and enrichment. And, in turn, that’s what your focus is on—others. You are completely focused on others because you genuinely want to serve them, and teach them, and help them, and make their lives better. It isn’t out of a selfish hope for reciprocity or quid pro quo, as in “if I do this for you are obligated to do this for me.” You want nothing out it, except for the good feelings that come from doing wonderful things. Plus, you’re surrounded by family and loved ones—not an enemy in sight. No need to lie, no need to cheat, no need to hide, no need to make a profit, no need to suffer as a result of bad choices. It is truly heavenly in every sense of that work. Here you are driven to create things that bless the lives of others, and here you are given every tool and resource you need to do that, including all of the resources of time and space—and it is all free to those who learn how to wield it. You can learn whatever you want, visit any place or time you want, spend your existence however you want. The sky is the limit. Wait, let me walk that one back, even the sky isn’t the limit. But you’ll find that the most fun occurs by helping others find peace, and joy, and continual improvement and refinement. And thus, glory will be added upon glory forever and ever. Now that, my friends, sounds like real fun—not the sensual counterfeits created by false gods—but real, lasting, meaningful, and genuine fun that is a gift from our Heavenly Father. Fortunately, we can experience that kind of celestial fun here on earth. The only thing stopping that from happening right here and right now is you. And the guy next to you. And that girl over there. And me. Which brings me to my next point. Obedience isn’t just fun. Obedience is empowering. If you or I really want to change and improve—change we will! We are, after all, eternal beings living in a moral world. It is easy to forget sometimes, but every single one of us is the son or daughter of an omnipotent God! He has the power to do absolutely anything; therefore, as his offspring, it is possible for us to be able to do absolutely anything too—IF we have his approval and his help. Which he as promised to give to us. After all, he wants us to become just like him. In fact, Jesus commanded us to do just that. He said, “Be ye therefore perfect, even as your Father … in heaven is perfect.” (Matthew 5:48). Therefore, he will give us the power to do that. You know, what would be really nice, is if Jesus would give us two or three or four authoritative volumes telling us exactly how he helped other people in other times and places become more like him. We could sure learn a lot from such a record. Of course, it would probably be thousands of pages long and would be much too much for us to carry around in our pockets and reference whenever we felt like it. Or, since our world is presently too wicked for him to come here in person, maybe he could talk directly to a handful of really good people who are living on earth right now. They could represent him and relay his thoughts to us—sort of like ambassadors. That would be nice because we can see with our own eyes and hear with our own ears their teachings. We could also observe their behavior and emulate everything that is good about them. 12 or 15 individuals should be enough for now. 70 if necessary. Maybe more. Maybe a lot more. And maybe he could assign others in our neighborhoods to watch over us and minister to both our physical and spiritual needs so we don’t get hungry, or injured, or lost as we go throughout our week. Sort of like shepherds who watch over their flocks. And what if we met together regularly to talk about all these things and study them in our chapels and temples? And what if we received assignments to practice what we were taught to the people in our homes and with our friends and neighbors? What if we read and pondered over them every day—even memorized parts of them? After all, these instructions tell us everything we need to know to become more like God. 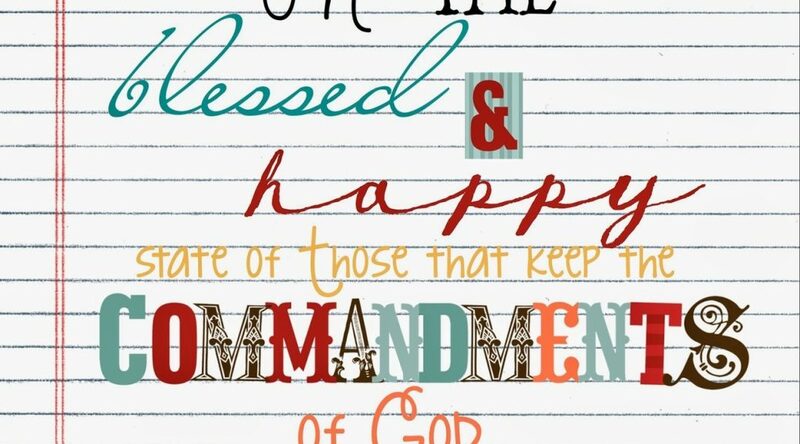 Then—and here’s the clincher—what if we chose to follow these “commandments” with as much exactness as we could muster, and quickly repent whenever we fell short (which for me will be in about 20 minutes). If we did that, we would soon discover that we have been endowed with awesome amounts of power. Not power the way the world sees it. The power of the world is the power of the devil and it is almost always used to demand, debase, debauch, denigrate, deceive, dictate, defame, defraud, deprive, deride, discourage, disrupt, divide, distress, damn, and destroy. That is the phony and fleeting power that comes through wealth, and rank, or sword. No, the power that we’re talking about is the power above all others—the holy priesthood of the Lord. This is true power. It is the power to love, to create, to enlighten, to transform, to bless, to heal, and to forgive. It is the power to rescue, to redeem, to restore, and to resurrect. It is also the power to seal, to exalt, and to enthrone. This is the power that that created billions of galaxies and billions of stars and billions of planets and billions of people. This is the power that organized our beautiful world, from the deepest oceans to the highest peaks, from the plankton to the pachyderm, all of which are currently living celestial laws. They heard the voice of their creator, chose to obey his words, and were subsequently organized into something amazing and wonderful and they have joy as they are fruitful and multiply. And you and I get to share this planet with these celestial creatures. If only you and I were just as obedient as the common honeybee. This priesthood power isn’t something that is horded or locked away in a safe by Heavenly Father. It is freely shared with his children. Of course, these powers of heaven “cannot be controlled nor handled” unless we obey righteous principles (D&C 121:36). Of course, as members of the church—regardless of our gender, regardless of our age, regardless of our family situation—we all benefit from the holy priesthood, as we did a few minutes ago when we were placed under covenant by a kneeling priest at a sacred alter and promised to always remember and obey the Lord; after which we consumed two consecrated emblems as a token of that covenant which made it binding upon us. Living up to the obligations of that covenant will wash away our sins and purity our hearts and minds and allow us to receive personal revelation and personal visits from a member of the godhead! In other words, obedience allows us to partner up with an omniscient and omnipotent being. I say you can’t get any more empowered than that. Alright, so we’ve established that obedience is fun, and obedience is empowering. Next, I’d like to state that obedience is adventurous. Because as we obey, the Lord is going to send us on quite a few adventures and we will say and do things that we never would have done on our own. Let me elaborate. We just talked about how God will send someone from his immediate presence to whisper in our ear to teach and guide us at times in our lives when we need His help. He will enlighten our minds, bring peace to our souls, and cause our hearts to burn—in a good way. But he will also inspire us to act—and sometimes act in non-traditional, atypical, and out-of-character ways. He will push us in directions we often don’t want to go because, if we were left to our own preferences, we would seldom leave our comfort zones. But to those who are obedient, he will call you on mini missions to bless the lives of individuals at just the right time and just the right place, wherever and whenever that may be. It may be to a poor family in Honduras or it may be to a lonely widow in line at Harmons. It could be to a mission to preach to Popes and Presidents, but it is far more likely to be to Priests and Beehives. But wherever it is, whenever it is, as we do what the Spirit dictates, even if it messes with our routines and schedules and appointments and assignments and hobbies and vacations and sporting events—we will find ourselves on a sacred errand of the Lord, doing something that only we can do. And as our last prophet used to say, “Whom the Lord calls, the Lord qualifies” (Thomas Monson, Duty Calls, April 1996 General Conference). So far, I’ve talked about how obedience is fun, empowering, and adventurous. Let me continue with some other appropriate adjectives. Obedience is daring. It is not done by the faint-hearted. You must have courage because you be faced with temptations, and ridicule, and condemnation, and even persecution from the devil and his millions of miserable minions. If you don’t think you have enough courage, that’s okay, the Lord will give you what you need. He will arm you for your battles. Be brave. Be audacious. And if things don’t go well in the short-run, remember, he will also bind up your wounds, heal you, and then make you even stronger. Dare to do right! Dare to be true! You have a work that no other can do; Do it so bravely, so kindly, so well, Angels will hasten the story to tell. Dare to do right! Dare to be true! Other men’s failures can never save you. Stand by your conscience, your honor, your faith; Stand like a hero and battle till death. Yes, it takes courage to be obedient. Obedience is liberating. Some rules, especially those that are inspired by God, are always meant to give us more freedom, not less. Cesar Millan is a dog behaviorist. In 2004 he started a television program “The Dog Whisperer” to help dog owners train their misbehaving canines. He said that one of the keys to helping dogs is they need to know who their pack leader is, and they look to that leader to establish rules, boundaries, and limitations. If the leader doesn’t step up and lead, the dogs set their own rules, boundaries, and limitations—which doesn’t often end well. Because they had a hard time obeying those, God allowed Moses to issue more detailed instructions that governed their day-to-day behavior. By the time the 40 years was up, they had 613 commandments. By the time Christ came, the Pharisaic Jews had created thousands and thousands of additional rules, such as not looking at a mirror on the Sabbath, or not walking more than 2/3 of a mile on the Sabbath, or even lighting a candle on the Sabbath—you could hire a gentile to light one for you—but you couldn’t light one yourself. It’s not so hard to see that ever-increasing progression of law-breaking and law-making. In 1927, 138 years of federal laws were codified and placed into a single volume. 91 years later there are more than 46,000 pages spanning scores of volumes. The IRS alone accounts for 7,500 pages. And there are 20,000 laws just governing the use and ownership of guns. We also have laws in our state, in our county, in our city, and in our neighborhoods. Just try leaving your trash cans out for a week and see what happens. With more than 40,000 new laws added each year, chances are you and I are already law-breakers. No wonder we suffer from so much anxiety. You see, governments created by man just can’t do this whole law thing very well. While many are well-intentioned, they always end up in tyranny, slavery, and despotism—which is exactly what Satan wants. But God is different. He only has a few laws.The laws of obedience and sacrifice, the law of the gospel, the law of chastity, the law of consecration. But really, all of these can be boiled down into just one law. Love everyone, including him, with as much love as He loves you. If we do that, we’ll be just fine. In fact, we’ll be well on our way to perfection. In my opinion, having just one God-given law is a lot more liberating than hundreds of thousands of man-made laws. Wouldn’t you agree? Obedience is strengthening. Resistance to the things of the world inoculates us from the buffetings of Satan. It also increases our spiritual muscles and allows us to go on spiritual journeys. It empowers us to do God’s work. Obedience is revolutionary, particularly in our modern world that teaches us to be defiant and autonomous and independent. Sadly, now-a-days, it is revolutionary to choose to be obedient. I could go on and on, and I’d encourage you to go on a little intellectual journey of your own and think of all of the positive ways obedience has blessed your life. It will shift your paradigm. Obedience has been our topic today. Frankly, I’ve never liked that word. It reminds me of obedience training, something we do to our beloved canines. In our family, we have a little Yorkshire terrier, his name is Max. He once knew how to obey. But now he’s 17 years old, which means he’s in his mid-80s in doggie years. Now-a-days, he kind of does whatever he wants because he won’t be with us much longer. Which is as it should be for someone in their 80s. You’ve earned a little deference. So when I think of obedience, I immediately think of dog training. Where you, the “master”, blow a whistle or issue a command, and then you immediately give out little treats if they do the desired behavior, or little shocks from a shock collar if do something wrong. It is all very deterministic and behavioral and Pavlovian in nature, and I don’t like it. It seems very manipulative. But it works. It gets the behavior we seek. At least, for a while—until the rewards or punishments cease. Or until the memory of those rewards and punishments cease. Which is why God doesn’t treat us that way. Most of the time, his rewards and his punishments aren’t immediate and noticeable. Which is a fabulous blessing for you and me. You see, this delay in dishing out consequences is an indicator of the deep mercy he extends to us. He is literally giving us time—time to stop and think and reflect and improve and repent before he allows the natural consequences of our choices to take effect. In Alma 42 we learn that “there was a time granted unto man to repent, yea, a probationary time, a time to repent and serve God.” As Alma put it, the only way the plan of redemption can be brought to pass is if people repent while in “this probationary state, yea, this preparatory state; for except it were for these conditions, mercy could not take effect except it should destroy the work of justice” (Alma 42:13). But how is this possible? How can natural and eternal consequences be delayed? Why do we have this extra time? We can thank Jesus for that. Remember, the penalties for your sins have already been assessed. Your punishment has already been transferred to someone else. Your ransom has already been paid. Your chains have been removed. Your debt has already been wiped off the books. The Law of Justice has already been satisfied. And it is all thanks to Jesus. You and I didn’t suffer the consequences of our bad behavior. That burden was borne alone by the Redeemer. And that experience was so incredibly awful that we cannot even imagine the pain and anguish and trauma and torment. But this is nothing new. Jesus has always stepped up to help out whenever we fell short. If we could have our pre-mortal memories restored, I’m sure we would find countless times Jehovah did something for us that we wouldn’t do for ourselves. Back then, and now, and in the future, he will continue to sacrifice himself for us. His love—and his sacrifice—is ongoing and eternal. Which is why we don’t have to experience one bit of the punishment which we rightfully deserve. We did the crime, and we should do the time. But the Savior already suffered for our sins. Of course, he expects something out of us. He didn’t just hand us a get-out-of-jail-free card. We have duties and obligations to fulfill, and if we do our best to do them, he will relieve us of the punishments. But if we repeated choose to disobey his instructions, or neglect our duties, or fail to keep our commitments, we will effectively break this contract. And then, my friends, we will be subject to the penalty we deserve, and we’ll have to pay a very sore price. That’s one of the reasons God does not immediately punish us when we sin, because the price of sin has already been paid by Christ, He gives us the necessary time to change our lives and be healed through the redemption of Christ. And actually, I don’t think our Heavenly Father is big into punishment at all. We do a pretty good job of punishing ourselves and each other without his invention. In fact, as I read the scriptures, all I see over and over again is just how much he is willing to do to help us avoid negative consequences. He just wants us to experience as much happiness and joy as we want to experience. In fact, when I study the scriptures looking for punishment I usually see a withholding of blessings, or the removal of his protection, or a withdrawal of his influence, so we are left wide open to temptations and the buffetings of Satan. From time-to-time, I also see early termination of life if he thinks you’re doing way too much damage to others on earth and your time would be better spent in a place where you don’t have a body. Then our “day of grace” is cut short, as Mormon writes about his record of the last days of his people. As the world becomes increasing wicked day-by-day, those days will return. In fact, in the near future, those who cannot obey terrestrial or celestial laws will lose their bodies and take up residence in the spirit realm. The earth has been waiting a very long time for its sabbath day, where it can be transformed back into a paradise, before finally being translated into our celestial kingdom. Brothers and sisters, as we prepare ourselves for this time period, which is just around the corner, I pray that we will quickly raise our standards and become obedient to the laws that will help us return to the presence of God, where we will be filled with light, and joy, and peace, and love forever and ever.